Global marketing is the act of focusing a product on the needs of potential buyers in other countries. Typically, a global marketing strategy requires a business to do new market research, identify countries where the business’s product might be successful, and then localize the brand to reflect the needs of those communities. So, if you’re looking for inspiration on how to craft a successful international marketing strategy and expand your business’ reach, check out these examples from 13 successful companies. One of its most successful tactics is to host extreme sports events all over the world. 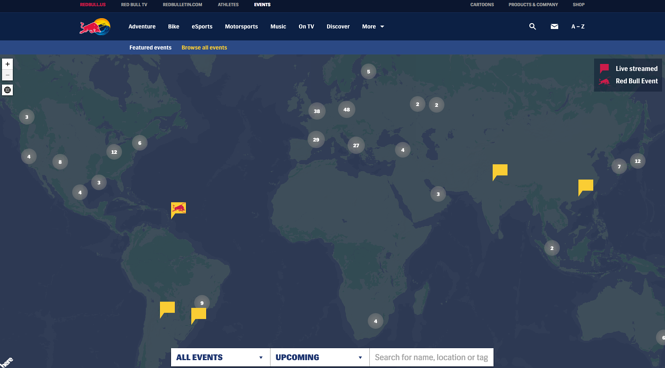 From the Red Bull Indianapolis Grand Prix to the Red Bull Air Race in the United Kingdom to the Red Bull Soapbox Race in Jordan, the brand’s powerful event marketing strategy takes them here, there, and everywhere. Aside from events, Red Bull’s packaging also plays a part in its global appeal. “Red Bull really looks like a product from a global economy. It doesn’t look like a traditional American soft drink — it’s not in a 12-ounce can, it’s not sold in a bottle, and it doesn’t have script lettering like Pepsi or Coke. It looks European. That matters,” explains Harvard Business School professor Nancy F. Koehn in a 2001 article. Though it’s since diversified its product selection since that article was published, the fact remains that Red Bull’s consistent packaging has helped this brand go global. Since then, Airbnb has grown to 1,500,000+ listings in 34,000+ cities worldwide. A large contributor to the company’s explosive global success? Social media. In January 2015, Airbnb launched a social media campaign around the hashtag #OneLessStranger. The company referred to the campaign as a “global, social experiment,” in which Airbnb asked the community to perform random acts of hospitality for strangers, and then take a video or photo with the person and share it using the hashtag. From Korea’s Grapefruit Coolata to Lebanon’s Mango Chocolate Donut to Russia’s Dunclairs, it’s clear that Dunkin Donuts isn’t afraid to celebrate cultural differences in an effort to strengthen its international presence. Similar to Dunkin Donuts, Domino’s has prioritized menu innovation as a means of increasing international interest and awareness. By making a conscious effort to gain a better understanding of the preferences of the markets it’s trying to break into, Domino’s can deliver pies diverse enough to gain international attention. The first feature the video spotlights is “Internationalisation.” The video walks us through how easy the service is for users, but is sure to emphasize the language and currency customization tool upfront. Even if your company is marketing to other regional companies, consider their global customers as if they were your own. WWF took its Earth Hour initiative — a voluntary worldwide event where participants turn off their lights for an hour to show how easy it can be to battle climate change — and brought it to Norway’s mobile audience. Scandinavian countries like Norway experience extreme daylight hours in different seasons, making the country a prime candidate for WWF’s Blackout campaign. Using digital agency Mobiento, the nonprofit placed the Blackout Banner across Norway’s top media sites to promote Earth Hour. With one tap of the banner, the screen went black. Finger swiping the black screen slowly revealed the Earth Hour countdown. The banner attracted roughly 1,000,000 impressions and the campaign received three MMA Global Mobile Marketing Awards back in 2012. That’s why Pearse Trust keeps content flowing on its Facebook page that engages its various markets. 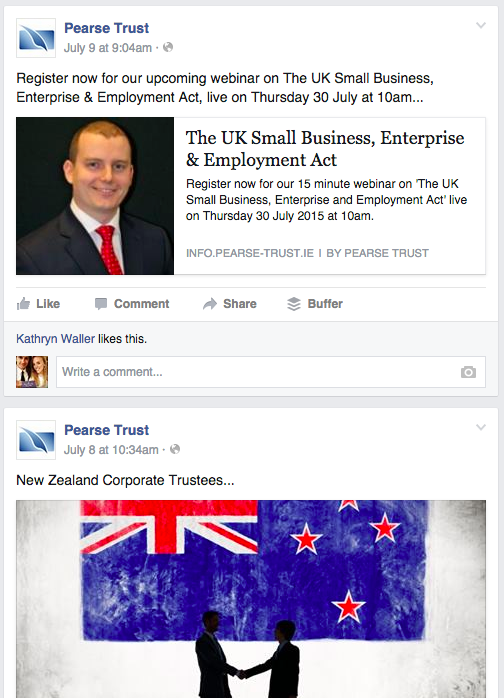 In this screenshot below, you can see Pearse Trust posts lots of content featuring international affairs relating to the company’s practice. It also levels out external articles with Pearse Trust content, featuring news from places like Germany, Ireland (where it has a Dublin office), and the U.K. (where it has a London office). This is a great example of focusing on common interests shared among your company’s various markets while also making the content relatable to customers by region. Although sponsorship spending can be fairly unpredictable — demand costs tend to surge due to triggers like championships and tournaments — these partnerships have certainly helped the brand capture the attention of a global audience. Nike’s NikeID co-creation platform serves as another strategy that the company is using to appeal to international markets. We all know McDonald’s is a successful global brand, so unlike its menu, I’ll keep it light. While keeping its overarching branding consistent, McDonald’s practices “glocal” marketing efforts. No, that’s not a typo. McDonald’s brings a local flavor, literally, to different countries with region-specific menu items. In 2003, McDonald’s introduced the McArabia, a flatbread sandwich, to its restaurants in the Middle East. This “glocal” approach has helped put McDonald’s at #9 on Interbrand’s Best Global Brands 2014. Innocent Drinks is the leading smoothie company in the U.K., but that’s not the only place you’ll find its products. 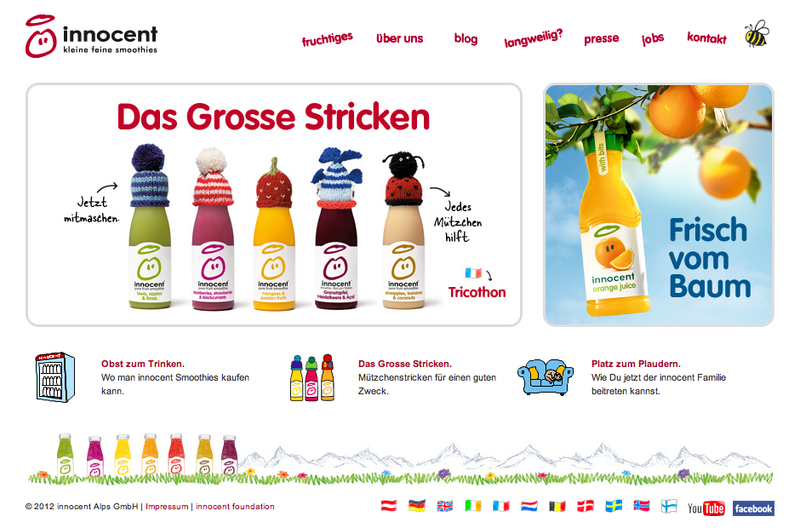 In fact, Innocent products are now available in 15 countries across Europe. While global expansion and rapid growth can sometimes distract a company from consistent branding, Innocent Drinks has managed to remain true to itself. By ensuring that the brand’s voice is interpreted the same way around the world, Innocent is able to create a more recognizable brand. The phrase “glocal” can be defined as “Think Globally, Act Locally.” But what happens when you switch the two around. Whoa, fasten your seat belts — literally. Unger and Kowitt is a traffic ticket law firm based in Fort Lauderdale defending drivers in the state of Florida. Not very global, right? Well, Unger and Kowitt understands that America is a melting pot and that Florida is bursting at the seams with different cultures and languages. Though a domestic service, the firm’s website is available in English, Spanish, Portuguese, and Creole. With these options, Unger and Kowitt can cater to Florida’s nearly 3.5 million Floridians who speak Spanish, Portuguese, or Creole. Don’t miss out on expanding your client base — sometimes you don’t have to look far to attract international business. As of 2018, Spotify was newly considered one of the best global companies in the world, according to Interbrand. We’ve all heard of Spotify (no pun intended), but how did it suddenly, and so quickly, expand from Sweden into other countries? 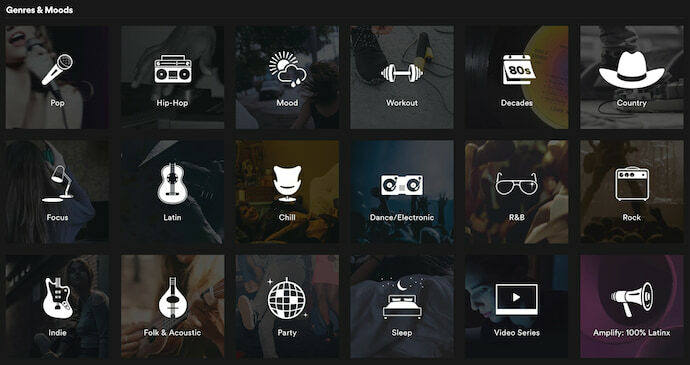 Spotify’s business model is focused on helping you find something new. It’s one thing to select a genre of music to listen to — it’s another thing to select a “mood” to listen to. The screenshot above is part of Spotify’s “Browse” page, where you can listen not just to “country” and “hip-hop,” but also music that carers to your “workout” or “sleep” preferences. If you have global aspirations for your business, you need to find out what customers in different communities have in common — and how to localize your product for these different markets. Your first step? Take inspiration from one of the 13 businesses above.